I wanted so badly to get some great photos of Mount Rushmore during our visit. The sky was clear and brilliant blue, the wind was calm, and I was ready to shoot. As I began snapping away, I noticed some small specks atop Theodore Roosevelt's head. Despite asking around, we were never able to determine what was really happening up there. I didn't get the clear shots I desired that day, but now it's fun to see the scale of the monument in relation to the tiny people on top of it. Do you have any ideas about what these folks were doing on top of Mount Rushmore? Please share in the comments! This post is part of Travel Photo Thursday at Budget Traveler's Sandbox. Please visit them for a wonderful glimpse into others' travels! What do you get when you pack four adults and five kids into a 3 bedroom 1 bath cabin for a week? Lots of crazy fun, as I recently found out! This one seems like a no-brainer, but I had to remind myself a few times throughout the week that it was not the end of the world if our eating and sleeping schedules were different for a week! Everyone gave a little in terms of when and how to do things, and it all worked out so much better than if we had rigidly stuck to our normal routines. And it was so nice to have everyone cooperating on meals, cleanup, and keeping an eye out for the kids. With little ones that still need naps and a good night's sleep, we found white noise to be essential for masking many of the noises that are inevitable when staying with so many people. I went low-tech and took along a small desktop fan for our room, while my sister used a white noise app on her iPhone. Both worked amazingly well and we all went home well-rested at the end of the week. We decided that each family would take their own breakfast and lunch supplies and that we'd do dinners together as a group, with each family being responsible for 2 dinners during the week (we went out for pizza on the 7th night). The dinners that were the biggest hits were ones where everyone could customize the food to their liking-- a waffle bar with toppings like whipped cream, spiced apples, sliced peaches, butter, syrup, and cinnamon-sugar to choose from, hamburgers/veggie burgers with various fixins, Hawaiian Haystacks, or Navajo Tacos, for example. My mom is awesome in general, and she is particularly awesome at keeping everyone engaged and entertained. Since we were at the cabin during the Olympics, she came prepared with sports equipment and activities for each day--badmitton, slingshots, baseball, kickball, tennis--and had a very cute "medals ceremony" with real medals for the kids at the end of the week. Not only that, she also packed a beautiful wood photography craft for my sister and I to complete and take home with us. We had all taken lots of books, art supplies, and board/card games, and although they didn't get used much due to the kids' obsession with the swimming pool and the Olypics on TV, it was nice to know that we had plenty to do if needed! What strategies do you use when traveling or staying with lots of people? This post is part of Travel Tips Tuesday at Walkingon Travels and Suitcases and Sippy Cups. Please visit them to see many great tips for travelers! One of the things I was most looking forward to in Kauai was the snorkeling. I had even purchased my own snorkel gear and somehow managed to stuff it into my only piece of luggage, a small carry-on bag. We were staying on Poipu Beach, one of the most beautiful beaches in Kauai, and despite being quite pregnant I couldn't wait to get out in the water. Unfortunately, on the day we arrived there had been an evacuation due to a tsunami warning caused by an earthquake in Chile so I wasn't getting in the water that day, lovely as it looked. I was happily snorkeling away despite the decreased visibility and had ventured quite far from the shore. Suddenly I was grabbed under the arms and pulled above the surface by a man I had never met. As I struggled to get free, I exclaimed, "What are you doing!?" He replied, "Your friends asked me to come save you since you don't know how to swim very well." Huh? I may be bad at a lot of things, but swimming isn't one of them. After a very strange conversation, we discovered that I was not, in fact, the person he was looking for. He swam off and I had a good laugh as I headed back in to shore, exhausted from battling the waves. A happy side note: The person the man had been looking for had made it safely back to shore on her own. I didn't get the awesome Hawaiian snorkeling experience I had been imagining, but I did get a funny story out of it. Now it's time for you to make me jealous. 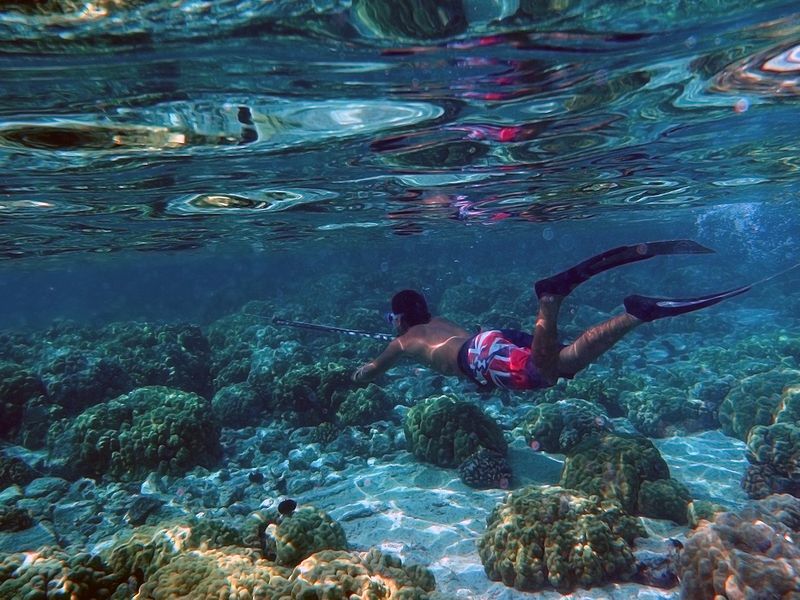 Please share your best snorkeling experience so I can live vicariously through you! This post is linked to Travel Photo Thursday at Budget Traveler's Sandbox. Please visit to see more delicious travel photos and stories! I had the pleasure of visiting New York City with my sister and husband one summer for a whirlwind three days before attending a wedding in the Hudson River Valley. What an incredible city! One of our goals for the trip was to do all of our sightseeing without using cars, including cabs. This might not seem like such a novel idea to NYC locals, many of whom don't own a vehicle, but for a Utah girl who depends on her car almost every day, it was pretty radical. Combine this with a crazy heat/humidity combo and the fact that my sister was 6 months pregnant at the time, and we certainly had an adventure on our hands. 1. After flying into JFK, we took an express bus from the airport to Grand Central. It was relatively easy and quick, and very affordable. 2. From Grand Central, we walked, yes walked, to our hotel near Radio City Music Hall. This one was a killer, given the aforementioned heat/humidity and pregnancy. However, it was worth it for sightseeing value alone, and it wasn’t all that bad since we only had carry on luggage (with wheels, thank goodness). 3. We braved the subway. After all the scary things we’d heard about the subway over the years, this one turned out to be a pleasant surprise. Very helpful employees, lovely air conditioning, easy-to-read maps, and took us pretty much everywhere we wanted to go that wasn't within walking distance. 4. We hoofed it. Walking everywhere allowed us to see so many great parts of the city, many of which we wouldn't have seen had we taken a cab. One day on our way to Central Park, we were suddenly surrounded by a large crowd. Music started playing and a bunch of guys broke out break dancing. We grabbed an ice cream from a nearby vendor and enjoyed the impromptu show. It was also rewarding to discover a couple of great delis/coffee shops after walking past them on the street. 5. We took the Staten Island Ferry, a great (free!) ride that gave us a fantastic view of the Manhattan skyline and the Statue of Liberty. 6. When it was time to leave the city and travel to the wedding near Fishkill, we walked back to Grand Central and took the Hudson Line train on the Metro-North Railroad. What a beautiful ride, right along the Hudson River! I would highly recommend taking this detour from the city if you have time. 7. Two days later and very sad to leave, we took the train back to Grand Central, then enjoyed a quick cup of coffee there before boarding an express bus back to JFK. I was surprised that I didn't miss having a vehicle at all, and actually felt that our trip was much more enjoyable without one. What cities have you seen without a car? Please visit Travel Tips Tuesday at Suitcases and Sippy Cups and Walkingon Travels for more wonderful travel-related tips! Every spring we take a motorcycle trip with some friends to Moab in southern Utah. Today, I thought I'd share some of my favorite Moab lodging, dining, and activity picks with you. We usually stay in a townhouse at the lovely Moab Springs Ranch. The warm, modern three bedroom/three bath condo (with 2 car garage) provides more than enough space for us and two other couples to stay comfortably. There is a fantastic, fenced, park area with huge trees and hammocks, a heated pool and hot tub, a pond, and a shallow wading "river" that is perfect for cooling off on a hot day. We like to prepare at least one or two meals at the condo, and usually end up grilling something delicious and eating on the deck as the sun goes down. I am also quite fond of the Red Cliffs Lodge just outside of Moab, which is especially great for those who prefer a hotel setting. 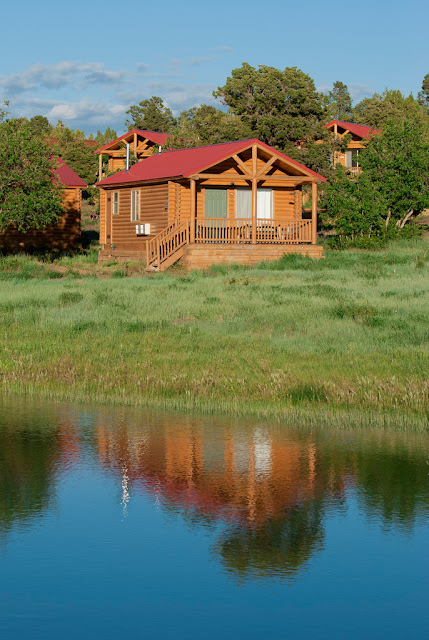 Rooms and cabins are spacious and have gorgeous views of the Colorado River and Moab's signature red rock cliffs. The Lodge offers a number of activities, a restaurant, and onsite Castle Creek Winery. I was sad to hear that one of my favorite Moab restaurants, Desert Bistro, has recently moved away from their location at the Moab Springs Ranch. It was so nice to be able to walk down to the restaurant from our condo; an alfresco dinner under strands of twinkling lights was a most pleasant way to enjoy an evening. The food is delicious and service is top notch (especially with Tatiana as your server). This one's definitely a splurge! It looks like their new location will be opening soon on Main Street. Moab Coffee Roasters inside the Lost River Clothing Company building on Main Street has the most delicious homemade chai I've ever tasted. Everything at this little coffee shop appeals to me--the unique and very knowledgeable owner/barista, the hand drawn coffee bags, the fresh coffee beans roasted in-house, the creamy gelato, and of course, the chai. Other dining favorites include Miguel's Baja Grill for Mexican, Moab Diner for breakfast, and Moab Brewery for a decent beer and pub fare. The real draw of Moab is its incredible variety of outdoor activities. With two national parks--Arches and Canyonlands, camping, hiking, world-class climbing, rafting on the Colorado River, mountain biking on the Slickrock trail, off-roading, and more, there is really something for people of all ages and fitness levels. Visiting Arches National Park and hiking to Delicate Arch (pictured below). There are two hikes to choose from, an easier one for families with kids that allows you to view the arch from a distance, and a more strenuous one that gets you up close to the arch. Whichever hike you choose, you will be in awe of the scenery! Exploring the area by motorcycle. Beautiful routes include the La Sal Mountain Loop Road, the Dead Horse Point Mesa Scenic Byway (state route 313), and the Upper Colorado River Scenic Byway (Highway 128--fantastic views of the canyon and the river!). Taking a picnic and going down the Potash-Lower Colorado River Scenic Byway (Highway 279). There are a number of picnic areas along the way, with amazing views of sheer red cliffs, dinosaur tracks, and Native American petroglyphs. Look up and you may catch a glimpse of a climber dangling high up on the cliffside! Moab's Main Street offers many interesting galleries, clothing shops, bookstores, gift and souvenir shops, cafes, and outdoor outfitters to explore. I always like to buy local notecards when traveling, and I managed to find some beautiful ones by artist Serena Supplee and photographer Tom Till . Have you visited Moab? What are your favorite things to do there? Please visit Travel Photo Thursday at Budget Traveler's Sandbox and Friday Daydreamin' at R We There Yet Mom to see many wonderful travel photos and stories from around the world! Disclosure: I do not post sponsored links or accept paid insertions. All places are mentioned here because I have personally experienced and enjoyed them. © 2012 The Particular Traveler. All rights reserved.. Simple theme. Theme images by bopshops. Powered by Blogger.